Jonathan Rea dedicated his dominant World Superbike double at Imola in Italy to former Kawasaki rider Joan Lascorz, who was sadly paralysed in a crash at the circuit in 2012. Ulsterman Rea has extended his lead in the championship to a huge 87 points over nearest challenger Leon Haslam as he powered to his second successive brace at the Italian track after achieving the same feat on the Pata Honda in 2014. 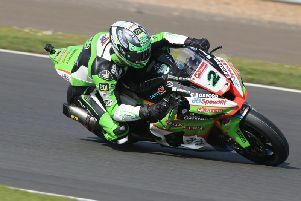 Rea had the upper hand over team-mate Tom Sykes in race one, which was restarted over six laps after an incident involving David Salom. Sykes was the early leader in the six-lap sprint but Rea took over on the run to the Variante Alta chicane and was never headed as he closed out victory by 0.482s, with Davide Giugliano third for Ducati on his comeback from injury ahead of Aprilia rider Haslam. In race two, Rea and Sykes pulled away at the front but the runaway championship leader again had more in reserve as he eased away from his team-mate to win by 4.3 seconds to secure an incredible eighth victory from ten starts this season. Spaniard Jordi Torres finished third (Red Devils Aprilia) after a technical fault hampered Ducati’s Chaz Davies, while British rider Haslam crashed out, enabling Rea to further cement his lead at the top of the points table. “It’s incredible and my team gave me a great bike. In race two, I was thinking so much of Joan Lascorz, this is for him,” Rea said. “Unfortunately he is not able to race any more because of an accident here at Imola so I want to dedicate this perfect weekend to him. “Kawasaki did a great job and they gave me a nice bike today to do my thing. We worked slowly over the weekend with confidence in mind that we could do a good job on the race pace. “I picked my moments and watched my board and when I saw the gap of one second I thought ‘let’s go’ and with four laps to go we had enough in the tank to have a comfortable victory. I’m just so grateful for this amazing opportunity Kawasaki gave me,” he added. The sixth round of the championship at Donington Park takes place on May 24.